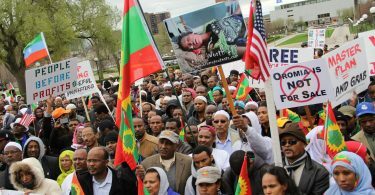 (OPride) — The ongoing Oromo protests in Ethiopia, which began on Nov. 12, have entered a decisive phase. Locals describe West Arsi, where the protests re-erupted on Feb. 14, as a war zone. At least 11 people and half a dozen government soldiers have been killed in a span of few days. Schools have been closed. Roadblocks have brought businesses and travel to a halt. With all semblances of civil administration erased, major towns and villages have fallen under heavy military occupation and a few had slid out of government control. The latest flare-up comes weeks after the Ethiopian government claimed to have brought the disturbances in Oromia under control through dialogue and public participation. The unfolding events across West Arsi and in parts of Wallaga and Hararghe make clear that the continued militarization of nearly the entire state of Oromia is backfiring. In village after village, people are saying, in words and deeds, that there is only one way out of the current crisis: The ruling Ethiopian People’s Revolutionary Democratic Front (EPRDF) must face the music of liberty and allow the Oromo people to exercise genuine self-rule as enshrined in the constitution. They want to hoist their own flag. They want to elect their own leaders. They want to have a say in development projects. They want to exercise their free will and civil liberties. New couples want to choose which music to play at their wedding. 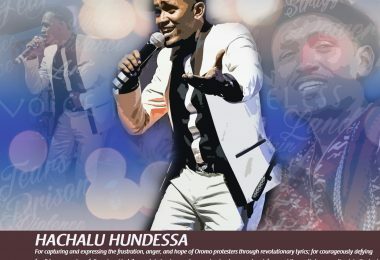 Oromo artists want to use their creative abilities and freely express societal grievances against those in power. In its violent, thus far futile, attempt to contain the Oromia-wide protests, the EPRDF regime is destabilizing the country and risks reversing Ethiopia’s modest socio-economic progress over the last decade. The reason is simple: an already enraged and disenfranchised youth is resorting to self-defense in the face of extreme violence unleashed by the security forces. It should not come as a surprise that, in few instances, protesters have already torched government installations, ruling-party-affiliated businesses and trucks. Ethiopia is clearly sailing in uncharted waters. Armed with sticks, mobile phones and social media apps, the youth across Oromia — from Ginchi to Guliso, Ambo to Nekemte, from Bale to Guji and Hararghe — have out-organized a repressive state for more than three months. To every additional repressive measure taken by EPRDF regime, protesters have responded with great resourcefulness and resilience. 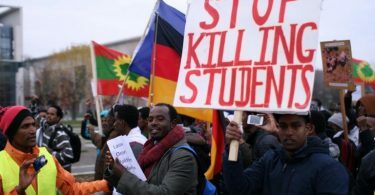 The sustained protests underscore one obvious fact: Ethiopia must address its enduring and existential threat, the Oromo question or risk imploding. Authorities have repeatedly claimed victory and lauded the public’s participation in putting the protests under control. Yet the protests continue to grow and expand across Oromia, including areas under an emergency military rule. Addis Ababa’s divide and conquer tactics, including attempts to frame the protests as a communal or religious conflict, are not working. Time and again, the Oromo protesters have made clear that their struggle is against an unjust rule and it’s not in any way directed at any ethnic or religious group. A case in point is the Feb. 18 public forum in Abaro, a small village near Shashamane, in which Oromo elders made the young promise not to attack other ethnic groups and religious institutions and to respect private property. The tens of thousands gathered at the meeting vowed to protect and rally neighboring populations to their cause. In fact, reports show that the Sidama people have joined the protests in West Arsi. EPRDF is no longer facing isolated protests but a revolution. 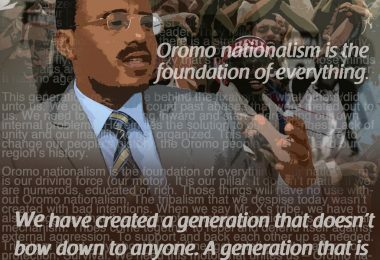 However, EPRDF leaders and its donors are far from correctly reading the writings on the wall. Ethiopia’s combative Communication Minister Getachew Reda, in his latest appearance on state-owned TV and in an interview with the Voice of America’s Jalane Gamada blamed the violence and loss of life in West Arsi on a nameless heavily armed force. He even speculated that “religious extremists” might be behind it all, a familiar tagline used by successive Ethiopian rulers — from Haileselassie to Meles Zenawi — to target and attack the Arsi Oromo. In his last address to parliament in 2012, Zenawi claimed to have uncovered an Al-Qaeda cell in Arsi, which turned out to be false—but not until scores were killed and hundreds rounded up in a security sweep. In his first and only comment on the protests that engulfed the vast Oromia region, the Ethiopian Prime Minister, Hailemariam Dessalegn threatened, in a line reminiscent of Col. Muammar Gaddafi before his unceremonious fall from power, to take “merciless action against trouble makers.” Where he came short in comparison with Gaddafi is in calling the protesters rats, a task he left to his foul-mouthed communication minister. Protesters had shrugged off Getachew’s earlier comments in which he called peaceful protesters demons unleashed by anti-peace elements. The regime’s rhetoric has vacillated between hard talk and conciliation. A few weeks after the “demon” and “merciless” speech, the ruling party made a sudden U-turn when the going got tough and acknowledged the protesters grievances were legitimate and that the excessive use of force was “a mistake.” Few are likely to fall for the latest extremist tag. People are not only visibly disdainful of government narratives but also beginning to speak up, unafraid of reprisals. Badhaso, a 75-year-old elder from West Arsi, typified such widespread popular sentiment in an interview by VOA’s Tizita Belachew. Tizita: What is happening in West Arsi today? Badhaso: the same thing that has been going on in other parts of Oromia. Yesterday, elementary and high school students in Shashamane staged a rally demanding the release of imprisoned protesters and the total scrapping of the Addis Ababa Master plan, which triggered the protests. The army came from nowhere and started beating, shooting and arresting. Since Monday, no student has gone to class. The protests did not stop in Shashamane. It is fast spreading. Tizita: who are the armed forces and what did they do? Badhaso: I do not know who they are. Telling from their uniforms, they are federal troops. 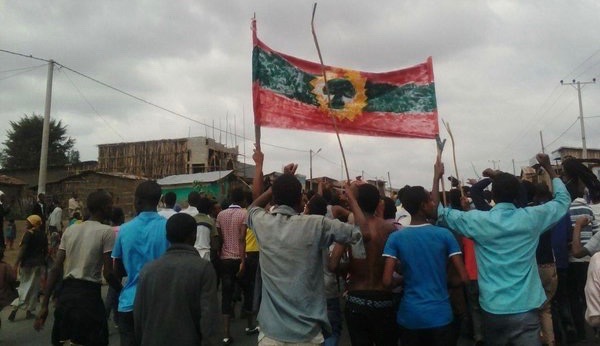 They went to schools and dispersed protesting students who took down the official regional flag replacing it with that of the Oromo Liberation Front (OLF). Soldiers followed and wounded two students as they run away. Tizita: were these the students that raised the banned flag? Badhaso: No. The wounded students were not the ones who raised the flag; the soldiers run wild and fire indiscriminately. They have been ransacking the town (Shashamane), abusing, arresting and beating locals. Few businesses are open and public movement is severely restricted. Authorities have been searching cars coming in and out of the town, checking IDs. People are confused and terrified. They’ve been waiting for the release of those who have been rounded up. Instead, more are being killed, wounded and arrested. All schools in the West Arsi area, including the private Ethiopia Adventist College, have been closed. Students from the Adventist College have also been arrested for raising the OLF flag. I have seen soldiers take away protesting students with my own eyes. Tizita: Do you fear that you will get in trouble or face repercussions for speaking to us (the media)? Badhaso: There is nothing new they can do to me. I spent most of my life in prison. People are already bleeding. It makes no difference if they dump water on our wounds. There has always been a problem. There has not been a time in Ethiopia when the Oromo people were free from these hardships. I’m reporting the truth about the violence meted out to Oromo people. They can do whatever they want to me. The Oromo fall under this oppression more than 150 years ago. Tizita: is there anything else you want to tell me? Badhaso: On Sunday (Feb. 14), soldiers fired at wedding goers in Ajje, a nearby town, wounding four. I went to the hospital and saw the wounded myself. The local people went to Oromia police demanding answers and were told that they knew nothing. The federal police arrived amid an ongoing standoff. The situation later degenerated into a confrontation since the people did not run away. Eleven local farmers were taken away. They have not been heard from since. Family members found their clothes, sandals and other belongings on the streets the next day. Tizita: Why were the 11 farmers taken away? Badhaso: Nobody knows. They (soldiers) beat, shoot and arrest anyone seen on the streets. No questions asked. They killed a local elder the other day. Tizita: who are these individuals? Badhaso: These were parents who came to town to check on their children attending school there after hearing reports of security forces surrounding, beating, and killing students. They committed no crime. Some people ran and got away when security forces began firing at the crowd. These are among those who were caught. People looking for their missing relatives found the missing persons’ shoes and shirts on the side of the street. There is no peace here in Ajje. Tizita: The government claims members of the police are among the casualties. Are the people armed? Badhaso: No. The public is not armed. Some people fired back using old hunting rifles in self-defense. Tizita: What do you see as a possible resolution to the ongoing crisis in Oromia and West Arsi? Badhaso: These people (in West Arsi and greater Oromia) have never had a government that represented them and accountable to them. The Oromo have been massacred, killed and mowed down for generations. These people have no right. They have been killed like a wild beast and thrown away. There has not been any accountability. Oromo life has less value than that of wild animals. People are often held accountable for killing wild beasts but not killing Oromos. Now the Oromo people must rise up in unison. They must realize Oromos are right bearing human beings. From Menelik to now, Oromos have been killed by successive Ethiopian rulers like a bird and thrown away. There is no place to seek redress and accountability. We are dead alive. We can’t fear death anymore. They are killing us using the same guns purchased by our own money and resources. The killers may have changed but the killing of the Oromo continues unabated. This collective punishment will continue unless the Oromo rise up in unison and say enough is enough to living with this shame. We must be united. Tizita: What would you want the government to do? Badhaso: Nothing. I have nothing to ask of the government. We don’t expect anything from this government. What do I expect from a government that sees me as a criminal simply because I am Oromo? I lost my son because he was Oromo. My father died suffering the same indignities and toiling this land. The same with my ancestors. This is a systemic and generational violence. Tizita: did you say your son was killed? Badhaso: Yes. My son, a fifth-year law student, was arrested last year and died a few days after being released. Blood came out of his mouth and nose while taking his final exams. So many gallant Oromo sons and daughters — like Baro Tumsa, Magarsa Barii and Nadhi Gamada — died fighting for Oromo rights. These people died because they were conscious and educated Oromos. They could have done so much for Ethiopia, Africa, and the world. People are still dying. It is this desperation that is pushing the Oromo over the edge. Analysis: Addis Ababa has lost the propaganda war thanks to social media and it’s in a panic mode trying to contain the ever-innovative street protests. Armed services and security forces — stretched too thin by widespread protests — are lashing out like a bull in the china shop. And rumors of internal discontent within the OPDO and the EPRDF coalition are rife. Efforts to purge the lower-ranking OPDO leadership under the guise of mal-governance have stalled. In short, the EPRDF regime is shaken and faces the toughest challenge to date in its quarter-century rule. EPRDF associates insist that the ongoing violent suppression is not enough. In a recent exchange on a local FM, Zami Radio, aimed at justifying and legitimizing an expected onslaught against Oromo protesters, former VOA journalist and unabashed EPRDF apologist, Mimi Sebhatu has accused the protesters in West Arsi with all kinds of crimes under the sun and urged the ruling party to take punitive action. It appears that the EPRDF regime and its cronies are busy inventing non-existent boogeymen, as they have done in the past at every juncture, to defame opponents. This time around Sebhatu et al. have clearly crossed the red line. And few should be surprised if such hard talk turned Oromia into a bloodbath. Regardless, Ethiopia’s rulers are unlikely to win the cooperation of the Oromo henceforth. They are better off listening to the protesters’ chants: No to repression; Oromia is not for sale, stop the illegal land grab; no to being ruled by Wayyannee (the ruling party EPRDF); respect and implement the constitution, make the promised self-rule genuine; Free Bekele Gerba and all political prisoners; remove federal troops out of the region, let Oromia police keep law and order. If unable to listen to the protesters’ demands, it should perhaps heed the ominous words of one of its own, Kassa Teklebirhan, Minister at the Ministry of Foreign Affairs, who recently warned, “Ethiopia should take lessons from Syria, Egypt, South Sudan, Somalia, Algeria, and Tunisia.” And perhaps Teklebirhan could have best served his country if he had directed that message to his government rather than Oromo youth.